And if TV is reliant on CGI for its special effects then the big screen is truly wedded to the technology. 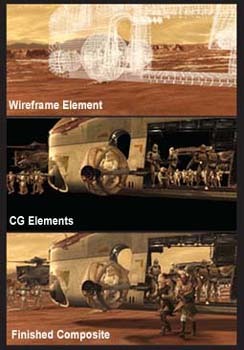 It's probably fair to say that without Industrial Light and Magic (ILM) there'd be no Attack of the Clones - at least not as we saw it - such is the movie's reliance of computer-generated effects. Fortunately, the world-famous digital effects house was well up to the task of helping create an image of the far future as believable as the characters that inhabit it. The task of creating the effects shots for Attack needed the setting up of three units, the workload made more arduous by the film's use of digital doubles - computer generated versions of 'real' characters. Take, for example, the fight between Obi-Wan and Jango Fett. According to Pablo Helman, one of ILM's effects directors: "I'd say half of the shots in that scene are digital shots, at least." Digital doubles of some of the principal characters are also being used in the latest seasons of Buffy and Angel. "We've set up certain animation cycles - walk cycles, run cycles, jump cycles, so that we can throw them into live action very quickly," said Loni Peristere, creative director of Radium, an effects company that has also contributed to Smallville. Another similar approach is to archive reusable effects. "We have a library of accumulated models in Buffy," explained Peristere. "We constantly have flying knives, flying axes, flying stakes, these kinds of things that need to be augmented or enhanced in scenes, so we just have a library of tools that we've accumulated that are photo real, and we use them regularly. Peristere's company has also been responsible for the 'dusting' effect used when vampires are staked. 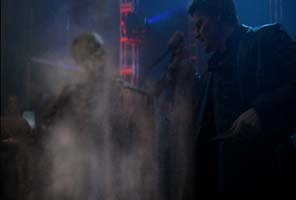 This has grown in complexity over the years from a fairly simple explosion of dust in Buffy season 1, to the mix of dust and skeleton that is now being seen on screen. And with processing power increasing and image manipulation software becoming ever-more versatile we can expect to see more use of CGI in the future - and not just for SF and fantasy shows and films. TV drama production like ER could soon be benefiting from a little CG treatment. Except, of course, with the current level of sophistication we won't being noticing the CG elements as they'll look just like the real thing. Special effects so special they'll be invisible.